Citrus and green apple aromas, with a hint of the variety's most distinguishing characteristic: the spicy fragrance of freshly ground white pepper. Ideal with fresh fish. Wine of Hungary. 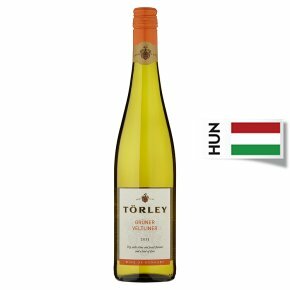 Dry, with citrus and peach flavours and a hint of spice.Grüner Veltliner - White Hungarian Wine This wine has a nose of fresh gooseberry with a hint of green apple and flowers. Well-balanced acidity and citrus fruits lead to a spicy, lively wine of minerality and elegance. Grüner Veltliner's crisp acidity makes it perfect either as an aperitif, or as a match for white meats with rich creamy sauces or Asian dishes.